I will never forget Owen Meany as long as I live. Like all books, the details will fade a bit, and someday I'll probably need to re-read, but I will live with these characters for a very long time. 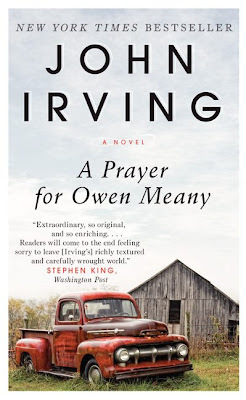 In A Prayer for Owen Meany, we follow Johnny Wheelright, the narrator, and his best friend, Owen Meany, from the time they are 11 into adulthood. Johnny is telling the story as an aging English teacher at a private school in Canada--a slightly miserable older gentleman fed up with American politics and attitudes during the Reagan administration (and looking back on Vietnam), struggling constantly with issues of spirituality. According to the opening lines, he believes in God because of Owen Meany. But that doesn't mean he's without struggle. One incident early in the book sets everything in motion. Owen hits a baseball that takes the life of Johnny's mother. While most people might've called that the end of a friendship, it's the crux of everything that comes after for Owen Meany. Everything. Owen believes he is an instrument of God. I was continually surprised reading this book. Surprised by the decisions the characters made, the twists in the story, but maybe most surprised by how funny it was. 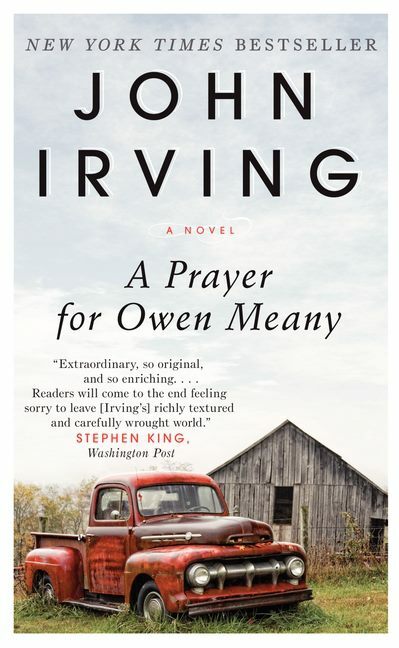 It deals with heavy issues, but after an erection at the Christmas pageant, an incident with a VW bug and a prep school auditorium, not to mention Owen's editorial writings for the school newspaper, it was clear that humor was just as important to Irving as the serious stuff. The characters in this book are so nicely fleshed out...they feel like real people I got to know. And when bad things happened to them, it really broke my heart. This book came together wonderfully well. It was fascinating to see how all the nuggets Irving had dropped along the way came together so perfectly. It made me sob, ok? I was sobbing on the couch at 1am. I'm very thankful that this book was chosen for the Estella Project and then voted in for the Estella Project Summer Readalong. I picked it up when I was in my early 20s and quickly put it down because I just wasn't in the mood. Without this push, I don't know that I ever would've gotten back to it, and that would've been a sad, sad outcome. It was slow going at first, with all the detail, but it's worth pushing through to fall in love with the characters and the plot. Books as moving and thoughtful as this one just don't come along very often. And I feel like this review hasn't done the book any of the justice it deserves. Oh the trials and woes of writing reviews of books we love. Ugh.